Beatrice was most recently announced as the winner of the 2018 Johansen International Competition’s viola division, earning the First Prize of $10,000. Beatrice performed on show 347, recorded in October 2017, at age 14. 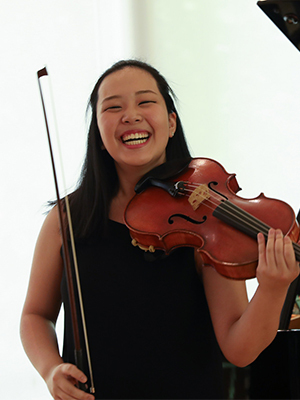 Beatrice Chen (viola), 14, lives in Chicago, Illinois and is a sophomore at the K12 International Academy. She made her concerto debut at age eleven with the Oistrakh Symphony Orchestra as a winner of the 12th DePaul Concerto Festival. Beatrice also appeared as a soloist with the Chicago Youth Symphony Orchestra Concert Orchestra as a result of winning the Chicago Youth Symphony Orchestras 2015 Concerto Competition. Beatrice is a three-time first prize winner of the American Protégé International Concerto Competition, resulting in three performances in Weill Recital Hall at Carnegie Hall. In addition, she is a first prize winner of the 2016 Society of American Musicians Competition and the 14th DePaul Concerto Festival. Most recently, she performed the Mozart Sinfonia Concertante with the Vicente Chamber Orchestra in Santa Monica, CA. Beatrice has performed on the Young Steinway Concert Series of Skokie, WFMT’s Introductions, and Show 347 of NPR’s From the Top. Beatrice was a member of the Young Performers Program at the Music@Menlo Chamber Music Festival and Institute of 2016. She was also a participant in the 2016 and 2017 Aspen Music Festival and School where she played in the Finckel-Wu Han Chamber Music Studio and the Aspen Philharmonic Orchestra. Beatrice is an active chamber musician and has performed numerous concerts throughout the Chicago and Los Angeles area. As a former member of the Ambassador and New World String Quartets, she has performed live on WFMT, at Symphony Center, and at various public schools in Chicago. In addition to chamber music and solo performing, she has been principal violist of the Chicago Youth Symphony Orchestras’ Symphony Orchestra for the past four years. She currently plays on a 2015 viola made by Keisuke Hori and studies with Matthew Lipman.